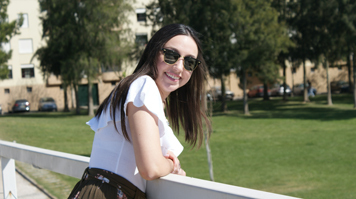 As an art lover, Ines knew that she wanted to live and study somewhere near to lots of cultural opportunities, and an Open Day at LSBU confirmed that she was making the right decision. “After I saw the facilities here and spoke to the Course Director, I knew I was in the right place,” she says. Now at the end of the second year, Inês still believes she is studying in the perfect place for her. “Having a campus in a central London location is fantastic if you are studying this kind of course,” she says. The eclectic and cosmopolitan setting of LSBU is also ideal for creative students, in Inês’ opinion. LSBU is open to every culture, every age, and every area of study. LSBU is really committed to helping us to become what we want to be, but that isn’t just an attitude it projects onto the students – it is one that the LSBU takes very seriously and applies to itself too.